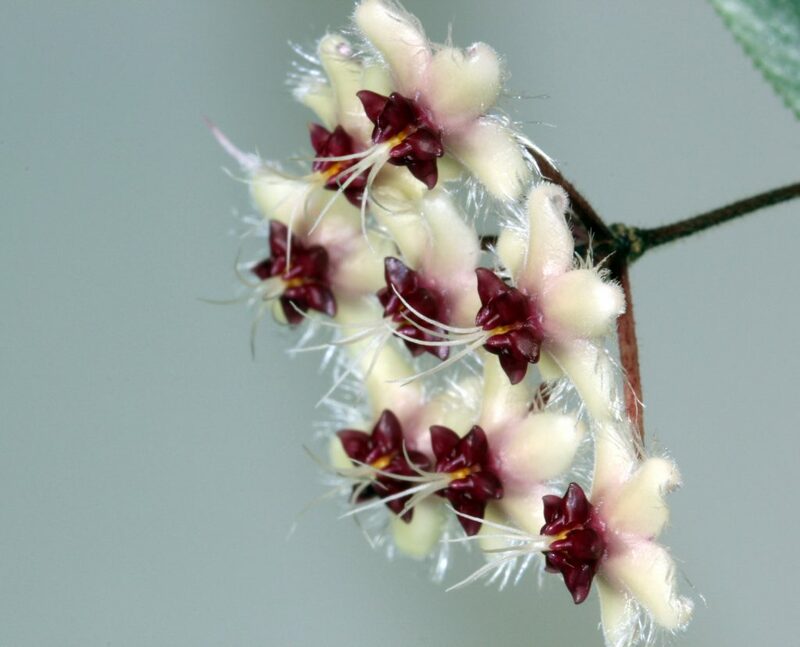 Hoya flagellata comes from Thailand and the flowers are so similar to Hoya caudata that many collectors think that it may just be another clone of caudata. H. flagellata was described in 1940. The leaves are long and narrow and get almost totally red in good light. The flowers are around .5 inch across (1.2 cm) and are covered with hairs. The corona is red with long hairs sticking out of the center. I wish I could tell you the secret to growing this Hoya, but truth be told I have been able to grow two peduncles and flower the plant, but have been unable to get the plant to grow even one leaf. I received it as a cutting in April of 2015, and I could not tell months later whether it was dead, or alive because it just sat doing absolutely nothing. Finally in March of 2016 it grew its first peduncle and flowered shortly thereafter. It then rapidly grew a second peduncle. I suspect that a very warm and humid terrarium might suit this plant best. **Update 2018** I had to start this plant over shortly after putting this page up. I finally got the plant to do well for me growing it in a mixture of large bark and sphagnum moss. Also, the secret to growing this plant is to not keep it too wet. Directly below is my new healthy plant that arose from the ashes of a cutting taken just in time to save it.